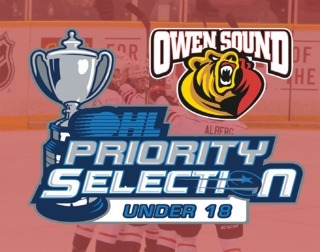 The Owen Sound Attack handed out their awards for the 2017-18 Ontario Hockey League season on Sunday, June 3, with Nick Suzuki taking home the most hardware over the course of the afternoon. In addition to taking home the Huron Tractor Supply Player of the Week Award after winning the weekly honour six times over the season, Suzuki also took home the the Tommy Burlington Award as the team’s leading scorer (100 points in 64 games in 2017-18) as well as the Jerry Reid Memorial Award as the squad’s regular season MVP. Suzuki was joined as a multiple award winner on the afternoon by Aidan Dudas, Mack Guzda, and Sean Durzi, but the day’s 1st award went to a player who has yet to suit up for a game with the Attack. Kicking the afternoon off was the Ray McKelvie Award, handed out annually to the team’s 1st Round pick in the previous year’s OHL Priority Selection. Taken 15th overall by the Attack in the 2018 OHL Priority Selection, Nolan Seed of Smiths Falls, Ontario was presented the award by the trophy’s namesake and Attack Business Manager, Ray McKelvie. 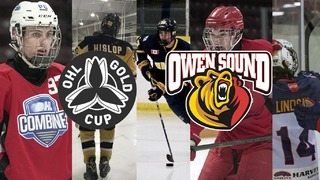 Seed, who spent his minor midget season playing with the Smiths Falls Bears junior squad, scored five goals and added 17 assists in 37 games while winning best rookie defenceman in the Eastern Ontario loop. 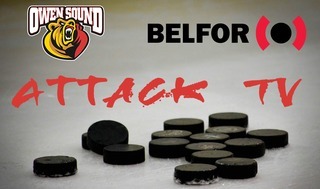 The Owen Sound Attack and General Manager Dale DeGray have announced the signing of 1st round selection Nolan Seed to a Standard Player Agreement and Education Package. 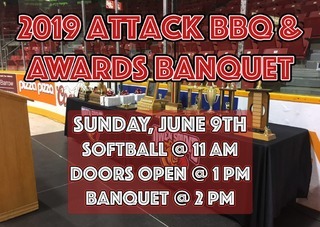 Following the announcement of the signing of Seed, the Attack returned to handing out with awards, starting with the Dave McComb Memorial Award for Leadership and & Perseverance, which went to Kevin Hancock. Despite an injury fraught season that saw him miss 15 games with a wrist injury, Hancock managed to build on his breakout campaign from 2016-17 and finish 2nd in team scoring with 24 goals and 45 assist for 69 points. Following the presentation of the Dave McComb Memorial Award to Kevin, the Attack then presented a pair of awards to Mack Guzda and Aidan Dudas. Sharing the team’s Howard Hindman Memorial Award as Academic Players of the Year, Guzda and Dudas certainly stood out off the ice as much as they did on it. Guzda, who was named the OHL’s Ivan Tennant Memorial Award winner as the top high school student in the league, finished his school year with an outstanding 93% average across English, Law, US History, Sport Marketing, Chemistry, and Algebra. Dudas was the OHL’s runner up for the Ivan Tennant Award, completing English, Biology, International Business, Advanced Functions, and Co-Op with an 88% average. Dudas’ 2nd award of the afternoon followed the presenting of the Academic Players of the Year Award, and was the team’s Pat McReavy Memorial Award as the squad’s Unsung Hero. In his draft season, Dudas showed the skill that will make him a highly sought after pick in the 2018 NHL Entry Draft, scoring 31 goals and chipping in 34 helpers for 65 points despite going largely underappreciated by those outside of the organization. Joining Suzuki and Dudas with multiple awards on the day was then Mack Guzda, who was tabbed as the team’s Rookie of the Year, taking home the Harry Lumley Memorial Award. Guzda’s outstanding rookie campaign in net was highlighted by his 1st career shutout on March 10 against the Saginaw Spirit, as well as a 14-6-2-2 record in 30 appearances; setting a franchise record for most wins by a 16 year old goalkeeper. The final double award winner of the afternoon, Sean Durzi was then honoured with the organization’s Dan Snyder Memorial Award for Positive Outlook as well as the Helen Lewis Players’ Choice Award for Dedication to the Team as selected by his teammates. Durzi, who also suffered an injury plagued season, broke out and became one of the top defensemen in the OHL in 2017-18, racking up 49 points in just 40 regular season appearances, along with 16 points in 11 post season games to help lead the team in playoff production. The day’s awards concluded with Trent Bourque, Ethan Szypula, and Brett McKenzie each taking home awards from the organization. Bourque, who scored his 1st Ontario Hockey League goal in Game 6 of the team’s Western Conference Semifinal Series against the Sault Ste. Marie Greyhounds, broke out in 2017-18, cementing himself as one of the premier shutdown defenders in the league. Bourque’s breakout campaign helped him earn the Harry Kazarian Memorial Award as the team’s Most Improved Player. Szypula, who just completed his 5th year of OHL hockey in Owen Sound, was named the recipient of the Red Leckie Memorial Award for Largest Contribution to the Organization in 2017-18 after an outstanding career that included many off ice memories. Szypula was always a fixture in the community, endlessly giving his time to a number of causes and making an impact in the lives of all that he touched. On the ice, he finished with an OHL career that spanned 320 games, 2nd most in Attack franchise history, and saw him rack up 61 goals and 120 assists for 181 points. The final award of the day, the team’s Butch Keeling Memorial Award for the organization’s Playoff MVP, was then awarded to Brett McKenzie. Acquired at the trade deadline from North Bay, McKenzie put the team on his back in the playoffs, scoring a number of big goals and tying Sean Durzi for the team lead with 16 points en route to earning the MVP nod. Also an overage player, McKenzie finished his OHL career this past season with 327 career regular season games played in the league and an impressive 59 career post season games. A full list of award winners, which will be updated Monday, June 5, can be found HERE.